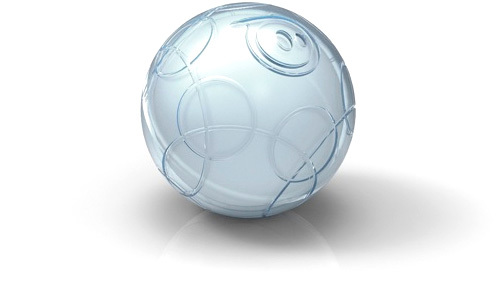 Sphero – A Smartphone Controlled Robotic Ball | OhGizmo! CES 2011 is just around the corner, and while endless aisles of 3D TVs and I suspect more tablets than I’ll ever care to poke at have a tendency to wear away at a blogger’s soul, there are hidden gems that make the whole experience worthwhile. Last year it was Qualcomm’s Mirasol displays that got me really excited, and this year I have a feeling a small robotic ball recently dubbed ‘Sphero’ could do the same. Originally shown as a prototype back in June, the slightly mishapen, smartphone-controlled ball has recently undergone a bit of a facelift for its debut at CES, and the rendered pictured above makes it look a lot slicker than its predecessor seen in the video I’ve included below. But what is it? Well in its simplest form it’s kind of a rubber ball for the 21st century. The ball is the most universal toy of all time, allowing you to play an endless number of games with it. But instead of whacking it with a bat, kicking it into a goal or throwing it through a hoop, you control the Sphero over Bluetooth via your phone’s tilt sensor, steering as it rolls around a flat surface. So imagine you and a friend placing your Spheros on a table and playing a quick game of sumo trying to knock the other ball off, or as a not-so-virtual game of golf where hitting the ball on-screen results in the Sphero actually moving towards a hole. The company behind the Sphero, Orbotix, has already created an open API so that iOS or Android developers can write games or apps that interact ball which is great because while there’s already exciting potential, you just know that some brilliant idea is going to come out of left field that will make the Sphero a must-have product. We’ll have more info and hopefully a hands-on look at Sphero as part of our upcoming CES 2011 coverage starting in January. OMG my cat would love this! Now you have a choice for your cat. iPad or Sphero! !